Decorah – Days 2 & 3 – is this Heaven? site was one of the placed visited on Friday. 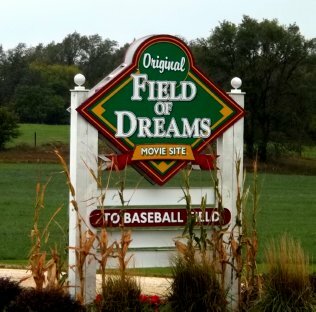 The 1989 Kevin Costner movie “Field of Dreams” generated one of the most memorable quotes you’ll ever hear about this state. “Is this heaven?” “No, it’s Iowa.” Even today people still ask that question. For people who live in Iowa and love this state, the answer might be a bit different – it’s a great place to live. 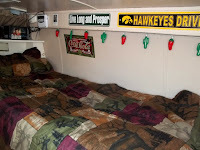 Dyersville (not far from the “Field of Dreams”) was where I rested and camped on Friday night. More about that in a little bit. For now, let me back up a little. On the way out of town, I stopped by the Fareway grocery store and tried something new (well, new to this German boy)… Kringla. For those who have never had it, Kringla is a sort of Norwegian sweet cookie with a soft, bread-like consistency. The dough is a typical butter, sugar, flour, eggs, buttermilk kind of thing with an almond flavor. It’s good stuff! After that I headed to Little Paint Creek Campground near the small town of Harper’s Ferry, Iowa. Little Paint is a state park and part of the Yellow River Forest. Primitive camping costs a reasonable $9 / night. 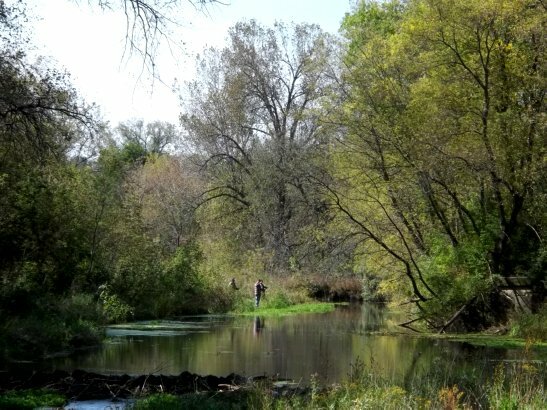 It’s a beautiful, safe, quiet park with lots of trout fishing opportunities. Unfortunately, due to foul weather, the pictures did not turn out well. By this time it was late Thursday afternoon and time to chow down. Here is dinner – a beer bread pizza. Some time back the local Dollar Tree store had a “Larry the Cable Guy Beer Bread Mix” for a buck. I bought one and mixed up a cup of it with a little garlic olive oil as well as some Blue Heron beer. 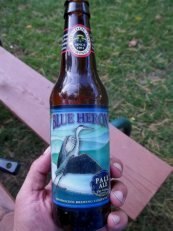 Since there was some beer left, I took a slug of it, and after the third time the beer came back up (with a strong aftertaste), it seemed this is not my type of brew! It gave the pizza crust a good flavor though! I’ll stick to Blue Moon for drinking. Since cooking utensils were at a minimum, the pizza dough was pressed into an oiled pie pan, and then topped with some Midi brand pizza sauce (fantastic stuff), a bit of cheese, and some Italian sausage that was made at a local grocery store. Before frying the sausage, I used a measuring spoon to make uniform rounded nuggets. They looked beautiful on the pizza! I also added some bell peppers, onions, and mushrooms which had been lightly cooked first. 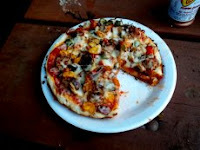 The pizza was then cooked in the little smoking grill. It sure hit the spot! In the morning (Friday) the weather took a turn. During the night night the outside temp had dropped and then jumped up a few degrees – an indication of clouds and rain starting to move in. As the sun came up, the trout fishing was already underway. The chilly rain shower increased in intensity. After catching four trout the rain got so heavy the fish stopped biting. Both layers of clothing were soaked with rain and I was feeling pretty sick. It was a good time to change apparel and move on. 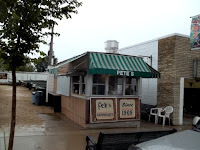 Lunch was consumed in Prairie Du Chien, Wisconsin at Pete’s Hamburgers, an area favorite. 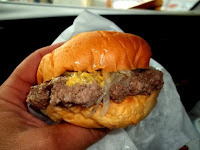 Their wonderful burgers are made with a special cut of ground chuck and simmered on an enclosed griddle with onions and water. I ordered “two with” (two burgers with onions on top). A little brown mustard was added. 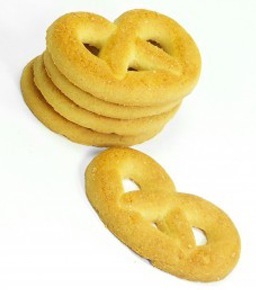 Back in the day four went down (one pound) in rapid succession. Two proved to be satisfying and a lot less sinful! Across from Pete’s is Starks Sports Shop. It is sort of a “one stop shop” for the hunter and fisherman. Since the last of the trout were not yet gutted, I found some great deals on fillet knives for $3.99 and $5.99 respectively. One of each was purchased. Stark’s also has a large liquor department. They were selling the little one shot “airline bottles” of booze for as little as two bottles for a buck! Since some campgrounds frown on drinking, you can belt one down and toss the bottle in the trash unnoticed. Suffice it to say the van is well stocked. Remember, drinking and driving is bad. Now driving first, parking it for the night, and then drinking a little… that’s much better! By now the cold had taken its toll and fatigue was setting in. 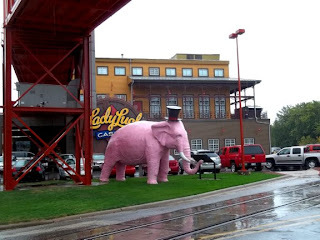 I was planning to visit the Lady Luck Casino and take a nap in the parking lot. That idea went out the window thanks to the Hot Jalapeno penny machine. After ten minutes of playing, it paid off and spit out $53 more than had been put in. Then it was time to make a hasty departure before temptation got too strong. The pink elephant mascot is kind of cool but then van was nearly clipped after I took this picture and started to pull into traffic. Oops! On down the road a ways was the Field of Dreams movie site. I have never seen this movie even though it was possibly the most popular movie ever made in Iowa… unless it is “Bridges of Madison County”. I vowed to rent and watch “Field of Dreams” as soon as possible. If you are in this area, I would highly recommend visiting this attraction. It’s fun, free, and easy to find. The two souvenirs purchased were a fridge magnet (for the van’s door) and well as a cute little rubber coin purse (the kind you squeeze to open and close) in the shape of a baseball. Thanks to the luck at the Lady Luck Casino, this new blanket / sheet set was purchased at the Shopko store in Dyersville. This design was seen at a store in Mason City earlier this summer. The funny thing is that bedding was on sale for about $53 after tax – the amount won at the casino. I took that as a sign that it was meant to be. By later in the afternoon the cold bug was rearing its head. The symptoms were getting worse and rest was not an option – it became mandatory. Anytime Fitness looked like a perfect place to rest last night. Some kind folks at the grocery store in Dyersville recommended a restaurant called Country Junction for some good old Midwest cooking. 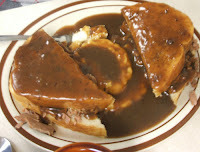 The waitress made a perfect recommendation – the hot roast beef sandwich. I don’t now if this is a regional thing but around here one of the most popular sandwiches is a “hot beef” or “hot pork”, a sandwich with roasted meat, bread, mashed potatoes and then drowned in gravy. It’s truly an all purpose comfort food. The grub really hit the spot. I had done a workout after dinner and it seemed to trigger one of those funky allergy attacks. Thankfully, Anytime Fitness was on top of a steep hill, all but invisible to cars on the street below. It was the perfect place to sleep after a large dose of Dyphenhydramine (generic Benadryl). That new bedding came in handy. I slept like a rock in the van until 5:00 AM when the morning exercise crowd woke me up. Talk about perfect timing! It’s good to be back at the home base. There is a lot going on right now and the coming days are bound to be stressful, but if it gets too bad, I’m going to back to northeast Iowa again. That area feels like home. No, northeastern Iowa is not heaven… but it’s the next best thing. Thanks for riding along! Take care!